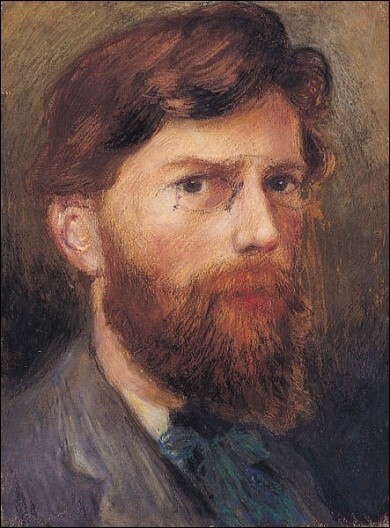 George W. Russell: A Self-Portrait. 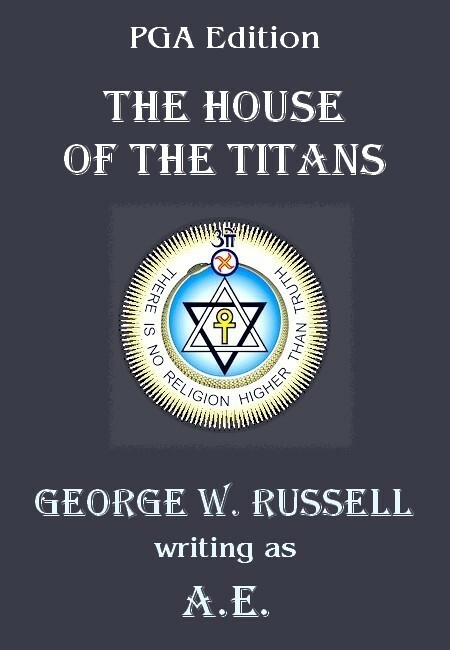 AE, pseudonym of George William Russell, (born April 10, 1867, Lurgan, County Armagh, Ireland; died July 17, 1935, Bournemouth, Hampshire, England), poet, artist, and mystic, a leading figure in the Irish literary renaissance of the late 19th and early 20th centuries. Russell took his pseudonym from a proofreader's query about his earlier pseudonym, "AEon." After attending the Metropolitan School of Art, Dublin, where he met the poet William Butler Yeats, Russell became an accounts clerk in a drapery store but left in 1897 to organize agricultural cooperatives. Eventually he became editor of the periodicals The Irish Homestead (1904-23) and The Irish Statesman (1923-30). 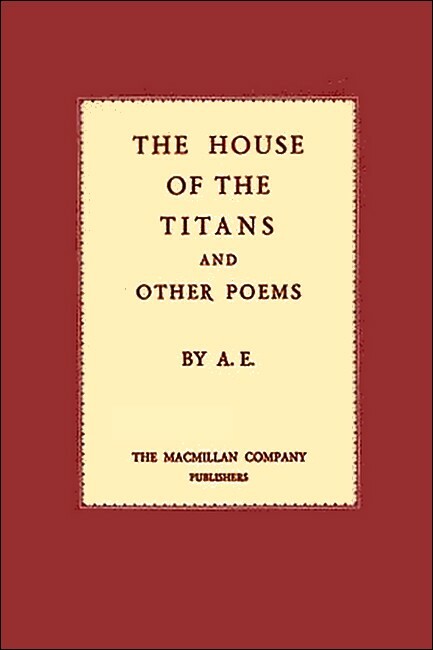 In 1894 he published the first of many books of verse, Homeward: Songs by the Way. His first volume of Collected Poems appeared in 1913 and a second in 1926. He maintained a lifelong interest in theosophy, the origins of religion, and mystical experience. The Candle of Vision (1918) is the best guide to his religious beliefs. I bring this poem, half dream, half vision, to you. Ironic eyebrows as you read the tale. When the dim fleeces move unto the fold. And no more holy fires were litten there. Armid, the wise child of the healing god. In the king's dun oblivious of the king. Have passed away, and have forgotten all." And at her calling "God-descended king"
We look for light, to you alone. When sorrowing you put the sceptre by. Would not your sorrow shared melt in our love? Must be endured, and there is peace in pain. I would know all, O god-descended king!" And the bright form went swaying as he played. That drew the soul unto their folding love. The gods had learned to weep, the earth's first gift. Was like the white uprising of the moon. The solemn cyclic motion of these spheres. 'Twere better that all memory should die,"
We almost mix in their eternity." Would be the blackest torture of the soul. Go mad unless you speak and tell me all." It might be but a dream, and thus it ran. And all things were at peace within the fold. Mingled together at the Feast of Age. Flared the high legions of the Light and Dark. Ethereal realms and dim underworlds. Around the burning multitudes of heaven. To them, and held its tyranny far off. Of heaven and of heaven's shining hosts. That could propitiate their demon gods. Passed by before their cry pierced up to heaven. The king on high sat aureoled with light. And none knew till it keened within the heart. Has come upon you. Rise and war on sorrow." Responding to the call of the high king. And Nuada spake thus unto the host. Save we can overcome that tyranny. Because of things that we imagine there. The Children of the Darkness cry to us. Must answer in the infinite brotherhood. The tender and fierce fire of spirit alone." "Who will go with me, warriors of heaven?" Athirst for the heroic enterprise. Offered each one his own peculiar powers. "To earth I give the magic of the mind,"
Said Manannan, nighest of all to Lir. And Dana said, "I shall make beauty there." And Angus said, "My birds shall waken love." Ogma, "The might of heaven is Mine to give." Fintan, "I shall bring memory and hope." "And I shall be the vanishing of pain,"
The sweetness of his youth on such a quest. A mirror of his own infinitudes. From the ancestral plains and Light of Lights. Were now without, beyond, and far away. Moving amid its woods, rivers and hills. And then it was forgotten utterly. Lights that made starry dreams of pride or power. Seemed but a madman dreaming of lost worlds. Downward and backward prowl unto the brute. That burned like evil fires within the gloom. Could satisfy the god-created lust. The worlds it spake of have long ceased to be. Upon her breast at her own impotence. By the unleashed brute in the titan heart. At the long peril of the night in time. As of celestial plumes fanning the air. They might have watched only eternities. Out of the Land of Promise comes to him." And came to the high king and told her tale. Than Ogma. Now he leads the giants in war. The sorcery overcome him and he forgets." But hers, and spoke as the high king had said. That voice again spoke to her spirit ear. "I am an enchanter. Say this to the high king." The primal forms of beauty for the gods. Her glamour. What need have we for enchanters! Praises beauty that is but redness of clay. There are too dark shadows about us for song." Shall have for cairn the glaciers over us. Unto that seer what the high king had said. "A healer too! Have we not Diancecht! Fierce as before. That is no labor for gods." The throne, and spoke even as the shepherd said. It is easier to rule the heavens than the earth." One who is master of so many arts." "Bring unto me that master of many arts." Who would not be denied still waited there. Through the great gateway to the brazen gloom. When dragon and mad colossi roar from their caves. For slaves to brawl in presence of their king." And at his words the titans crouching were mute. And with her came the master of many arts. But the high king and Armid saw the god. In the dark radiance under shuttered eyes. Hast from pity come to help us, fly. Be darkened, nor know of any other world." Art real, these, but shadows of immortals. Giving my light to see the unfallen lights. And dwell with thee even in this dark house." As if his song rose from the sun of life. With ever youthful and exulting voices. Is ever dawning on adoring eyes. Do you not know me? I am the All-Father's voice. I sing the deathless union between all things. That never dies and leads through death to me. Till the red flutterings of the heart are still. The dark rapture where they are lost in him. I am known only to self forgetfulness. My love shall be in thine when love is sacrifice." It seemed to waver between life and death. "Do not turn from me. Think on me long and long. Yet am I also mercy and forgiveness. Join in the cavalcade of starry minds. Know that all wisdom bides in joy or pain. Made clear by the pure spirit, its name is joy. For swifter absolution into the heart. At love that is more even to thee than life. Yield to me and thou art my conqueror. There is no other god than me to fear." Of Dana, mother of all and comforter. And the dim murmur from the duns of men. Mete Justice from a thousand starry thrones. My heart shall be in thine when thine forgives." Because I was the gentlest of the gods. My myrmidons are frail and delicate things. Becomes mighty as a star and none may touch it. I can stay the march of armies by a child. Images of peace in the All-Father's being. Can know itself in us as we in him. I will give unto thee this star to lead." Then came the voice of Fintan, the master of time. Has-been from yet-to-come and far from near. Unto horizons that forever recede. Between the vanished and the coming wave. 'O come. A treasure lies in the rich wilderness. 'Go not.' 'Thy love is dying.' 'Thy friend is false. Nor know that I am in their every breath. Immortal voices spake the Son of Lir. A honey harvested from many lives. All life that breathes within it to be thy own. As children fly to a beloved breast. I will give thee the wisdom of eternity." The master of many arts was heard no more. Earth had not known before the spirit came. Sovereignty over all the elements. Life breathing life, no longer solitary. The titans raving madly in the hall. And clutch with miser's eyes. And I cast them away. As a god child might in play. Above the vale of rest. O'er which I bent alone. A dark glory of stone. Stillness of earth and air! And the god is there. The lake and the shadowy wood. With sudden color. O, the hyacinths! Dense to the body, to the spirit most clear. Of many million years breaks now to dawn. In a little dust? I glow to the full orb. Make visible the laughter of their king! Becomes music to the eye, joy in the heart! What secret lies behind the lovely light? Voices call to me, "O, come home, come home!" I  wake from her sweet play. Ripples of shade and flame. I fly thy slave to be. Yet come again to me. And stone-gray air that reels dizzy with mist. But that which has some touch of the timeless on it. Jetting gay fire into the fireless mind. By Him who is poet both of heaven and earth. That makes them one with it on the night-shadowy hill. And the great deep lay hollow, lightless, blind and dead. Sadly the over-shadowing forms of might depart. His eyes with longing no more search the mystic sea. "One infinite, thy love, is life enough for me." O, no, I was not wanton with that man. My myriad girlhood, in that printed page. All innocent upon a fairy isle. Wrecked on a flinty look. O, I remember. Half laughing and half scornful, to my fate. As if they had not legions at their call. A slippery dancer, reels from wave to wave. That it desires, the point in the other's breast. The exquisite anguish of our piercèd heart. So flashed our speech. The first of many times. An ampler, wiser heart-nurse to myself. In the heart's doubt what would be noble to do. From the imperious heaven of the high will. Dressed in the actor's body cry on a stage. The instruments the gods must use in us! He might have leaped from an archangel's dream. That rested on the boy, or the sweet words. Searching the blackness of my night for God. A mourner in the thick of erring delight. To win her way even if soul be lost. In dark reverse unto their opposites. And pure and holy are made poisonous. The same although I moved to the same end. As with that other, the sole star of the heart. And one, the outer image of a god. Even rumor had no further secrets to tell. Was I so lost from myself, so terribly his. But to win fuel to keep high one's fire. Cry the same words they scorch with double fire. Were sundered. With no other word he went. Slaying the unnatural with the natural love. Could make them visible for ever. The maid would greet a lover who came to her. That he had come to know himself and me. O, why are we not certain of our fate! There was another dread enchanter imagined. In an eternal storm, cling to each other. To whom his hands clung in the eternal shade. Beautiful, mad, hopeless, of that boy. And all my pillow was a wetness of tears. Be broken by the dawn. No hiding beast. Had it flown, the dragon of desire? Light and air made music as before the Fall. Feet danced, hearts were airy, thoughts gay--gay as flame. Unlit, black ages, crucifixions, agonies?" Where all things were in league. Even the stars drew nigh. A marvelous sweetness breathed. Was it from earth or sky? To sit on thrones starry with the Ancestral Lights. The wars of time were ended, the gates of the heart unbarred. A vastness flooded their being, a vastness myriad-starred. The soul remembered its youth. Oh, in what deeps, what heights! "It is coming!--O, it Is coming! The Golden Age is nigh! See what star-glimmering citadels rise in the blue! For us who strayed, who were lost, who rise again from the dead. From earth to heaven of heavens. All that glory is ours!" Was again in the iron time. An unassailable sky. Above, and darkness before us for blind uncountable years. With soul or sense or thought. I complain not nor wonder. O, how my heart leaps up! I can sing! I could fly! Of cross, of passion and the martyr's pyre. Fancies came thick, heart-troubling, honey-rich. And become slave to it. But remembrance came. But a radiant shadow in a blur of light. Was it all self-begotten fantasy? Its starry dynasties from heaven to earth? Was it whispered into my spirit in passing? Did I imagine all from my own depths? Kissed nor heard in confession of love? More precious than their virtue distils for us! To give us creatures that are not of himself? O could our idleness grow to such virtue! Our lonely reverie break into multitude! The being of many risen within our own! And we are at once blessed and betrayed. In a radiant shadow in a blur of light. Were tender to us for an hour. A love breathed up from the dark clay. How can I win that love again? To be in league with these gray stones! Gay feet and flying tresses. And pine for through tears. The ores to make her fairy gold? The glow within the psyche's wing? Dance with their women light as air. What Thought digs wide the pit of space? What Will keeps the fierce stars apart? For this soft indolence of heart? The Great Deep's tidal under-tow. The gods we left behind? The wonder has not grown. From their own natural throne. The sibyls breathed of old. Will give itself to thee. Of its own beauty rayed. Was cast into the shade. For each alone was made. Wider than moon or sun! Then a vast and silent river seemed to roll and pass me by. All but the desireless spirit seemed to roll and pass away. Hurry onward on their flowing only those who are its slaves. Knew I could be lost for ever and was strangely comforted. Breathed within me for an instant, for an instant it was I. How grave this night are earth and air! In their profundity of peace. Shall grow as vast as that wide sea. The world wanders away from me. Beauty and love are clouds gone by. Heart is bereft of melody. This that is left:  O, is it I? That is, disrobed, so pale a thing? Heart has not strength even to mourn. The dust to which they shall return. And drone to it so vile a song. That was so very far away. Or the green earth has homelier grown. Woodland and water, hill and stone. A shadowy vale, a flickering stream! And stayed my listening ears. Washed clean and dressed in shining raiment. As if it had never paddled in the mire. That I might come fitly unto the feast. All breathe together in one melting chord. Must be the vision in brows that wear the crown. The stricken heart, within their sovereignty? Thought but the king gave unto it its light. In ageless beauty and with smokeless light. Their thought together, so contrary the lights. I cannot help you to the sense of it. Gaze back in wonder at our own endless heights. Madness of nights and days. Is love made fire by death. To me thou shalt return." Deep night or a new day. In what wide heaven it goes.